Students learning math are expected to do more than just solve problems; they must also be able to demonstrate their thinking and share their ideas, both orally and in writing. As many classroom teachers have discovered, these can be challenging tasks for students. The good news is, mathematical communication can be taught and mastered. 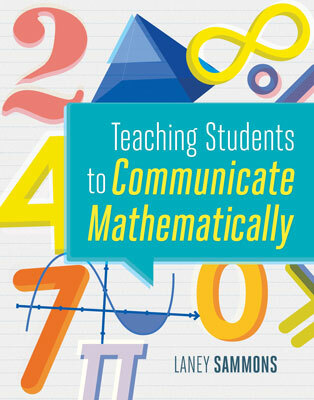 In Teaching Students to Communicate Mathematically, Laney Sammons provides practical assistance for K–8 classroom teachers. Drawing on her vast knowledge and experience as a classroom teacher, she covers the basics of effective mathematical communication and offers specific strategies for teaching students how to speak and write about math. Sammons also presents useful suggestions for helping students incorporate correct vocabulary and appropriate representations when presenting their mathematical ideas. This must-have resource will help you help your students improve their understanding of and their skill and confidence in mathematical communication. Laney Sammons, was a classroom teacher and instructional coach for 21 years before becoming an educational consultant. Since retiring from the classroom, she has worked with teachers of all grade levels throughout the United States and Canada to help them improve their mathematics instruction.